I received a free 3-month subscription in order to review Book of the Month Club. This post contains affiliate links. Don’t miss the Book of the Month coupon code for 30% off a 3-month subscription and get a free summer survival kit! With the mad rush of end-of-school year activities, I totally forgot to post my Book of the Month Club Unboxing photos. But the kids are settled for the summer and life has slowed down a bit. I received my first box in May and was pleasantly surprised by the care taken in the packaging. Similarly, my June book was shrink wrapped to a piece of cardboard to keep it from bouncing around the box during shipment. It also keeps the book’s corners from getting dinged and bent–which I hate. Again, there were 5 books to choose from. After careful consideration–these things are important-I opted for Emma Straub’s Modern Lovers. It sounds like a good beach read. I’m doing a bit of traveling this summer so it will be good airplane reading. One thing I love about Book of the Month are the bookmarks they include in each package. The bookmark is made of high quality, thick paper. It feels good against your fingers. I often hold my bookmarks while I’m reading a book. It’s a weird habit. You’re learning all about my weird reading quirks! Along with my book selection, I received a postcard with the same print as the Modern Lovers book cover and a note from Judge Morgan Jenkins on why she choose the book. Verdict: Once again, I’m pleased with the selection and process of the Book of the Month. The 5 book choices each month cover a wide range of topics to suit a variety of tastes. There really is something for everyone. Just join with code SSK5 by June 30 to get your Summer Survival Kit! Here’s a quick refresher of the Book of the Month subscription box. Each month there are 5 newly released (or soon to be released) books to choose from. 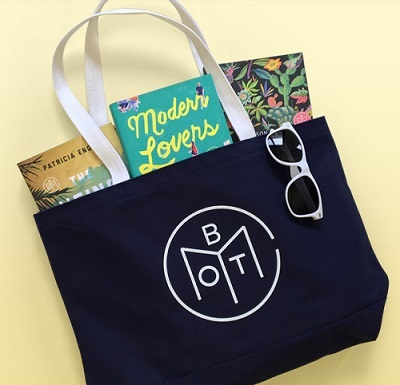 BOTM invites famous authors and celebrities to become Judges as a way of curating each month’s selections. May Judges were Josh Radnor, Alexander Chee, Nina Sankovitch, Leigh Haber, and Liberty Hardy. The selections span a wide range of genres. Click on each title to learn why the Judge chose it and read more about the book. Once you’ve enrolled (more about pricing later), BOTM sends a reminder email to choose this month’s selection. Current subscribers have until the 6th of the month to choose their book or skip a month (without penalty). Boxes ship on the 7th. I joined late, around May 10th and was given until the 14th to choose my book. Being the impatient book reader I am, I chose my book as soon as I signed up. BOTMC still sent me a reminder email, which I appreciated. When you choose your book, you can add up to 2 other books (from previous months, I assume) for only $9.99 each. Not a bad price for hardcovers. Shipping is still free. The hardest part: waiting for your book to arrive. Shipping is included in your monthly fee. Obviously the 12-month plan offers more bang for your buck. You can skip a month without penalty and your subscription expiration date will be extended a month. Just a note that membership plans will automatically renew at the end of your term unless you cancel. BOTM sends you a reminder email. You’ll have to call to cancel.